West Point, NY: The West Point Association of Graduates is pleased to announce that Lieutenant Colonel Matthew R. Myer, Class of 2001, has been selected to receive the 2018 Alexander Nininger Award for Valor at Arms. The award will be presented on September 27, 2018, at West Point, New York. Myer is a third-generation West Point graduate. He is currently the Commander of the 1st Battalion-501st Infantry (Airborne) Regiment, 4th Brigade Combat Team (Airborne), 25th Infantry Division. Myer has deployed several times to Operation Iraqi Freedom, Operation Enduring Freedom and Operation Inherent Resolve from 2003 to today. While serving as a Captain and Company Commander in 2007-08, he commanded Chosen Company, 2nd Battalion (Airborne) 503rd Infantry, 173rd Airborne Brigade, known under his command as the most decorated company in the Global War on Terrorism. His command included a 15-month deployment to Kunar and Nuristan Provinces, Afghanistan. During this tour, Chosen Company earned a Presidential Unit Citation Award and a Valorous Unit Award. In addition, 87 individual valor awards were earned by Chosen Company, including two Medals of Honor, two Distinguished Service Crosses, and 13 Silver Stars. 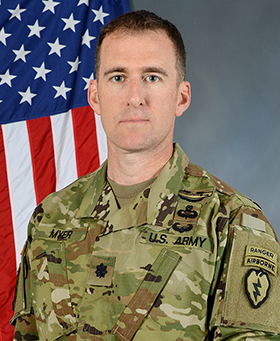 Myer earned one of the 13 Silver Stars on July 13, 2008 for his command at the Battle of Wanat, the most documented battle of the war. During the Battle of Wanat, Myer commanded the force during a ferocious battle with a superior enemy force. He lost nine soldiers and exacted at least 50 enemy KIA while calling in Close Air Support, Close Combat Attack, Artillery, Mortars and multiple MEDEVACs. In addition, he personally risked his life on several occasions. Myer also earned an Army Commendation for Valor in 2007 for his actions in an ambush outside of Wanat. Myer’s awards and decorations include the Silver Star Medal, the Bronze Star Medal with two oak leaf clusters, the Defense Meritorious Service Medal, the Meritorious Service Medal with two oak leaf clusters, the Army Commendation Medal with “V” device, the Joint Service Commendation Medal, the Joint Service Achievement Medal, the Army Achievement Medal, the National Defense Service Medal, the Afghanistan Campaign Medal with Combat Star, the Global War on Terrorism Expeditionary Medal, the Global War on Terrorism Service Medal, the NATO Medal, the Overseas Ribbon, the Combat Infantryman Badge, the Expert Infantryman Badge, the Ranger Tab, the Master Parachutist Badge and the Air Assault Badge.